Unshaded impervious surfaces like parking lots, roofs and roadways absorb and re-radiate heat into the atmosphere, contributing to high energy costs and global warming. In 2011, planners analyzed Montgomery County’s tree canopy — the layer of leaves, branches, and stems of trees that cover the ground when viewed from above — as part of an effort to improve the local climate of urban areas. The more shade, the less energy required for cooling homes and cars. Moreover, tree canopy shades impervious surfaces like streets, sidewalks and roofs, reducing the amount of heat that radiates into the atmosphere and the amount of stormwater runoff. The tree canopy analysis (PDF, 3.1 MB) conducted by the University of Vermont with high-resolution aerial imagery, found that much of the county contains a healthy level of tree canopy. However, many of the county ’s most urbanized areas are lacking shade — right where it is needed most. While Montgomery County’s business districts and urban areas should have at least 25 percent tree canopy to maintain a healthy environment, many have much less. 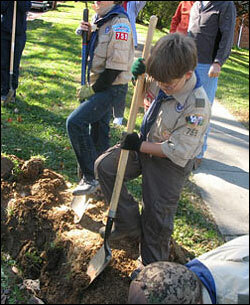 Members of Cub Scout troop #759 helped plant trees in Montgomery Hills in November 2011. 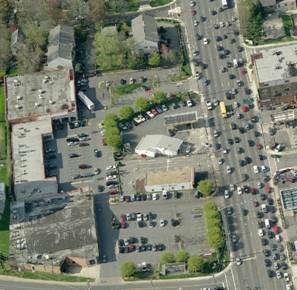 Montgomery Hills, a community just north of downtown Silver Spring, was found to have the lowest canopy cover of any urban area in Montgomery County. To improve tree canopy in the area, Conservation Montgomery organized a tree-planting project for November 5, 2011 at the Seminary Place Shopping Center and other locations throughout their neighborhood. Property owners agreed to a planting project that will place eight trees — four sugar maples and four red maples — in a large parking lot island in front of CVS and in four other locations in the adjacent neighborhood. Trees have been donated by Ace Tree Movers. Learn more about the Montgomery Hills tree-planting in this excerpt from our Montgomery Plans cable show. Want to know how much tree canopy shades your community? Contact us for a site-specific analysis.